Free midday music April 3 Wednesday at 12:30 p.m. The Secret Trio appears Wednesday April 3 in the UBS Atrium, Weehawken. The UBS Atrium Series continues its series of free lunchtime concerts with The Secret Trio on Wednesday, April 3 at 12:30 pm. The concert will take place in the Atrium at 1000 Harbor Boulevard in the Lincoln Harbor section of Weehawken. The Secret Trio features three musicians rooted in Turkish, Balkan Roma (Gypsy), and Armenian music. Formed in 2010, the three artists came together to create a new form of chamber music. Not bound by a single tradition, they perform original pieces and time-honored melodies that incorporate the microtonal modes and improvisation of the Middle East, dance rhythms of the Balkans, and elements of jazz, rock, classical, and world music. 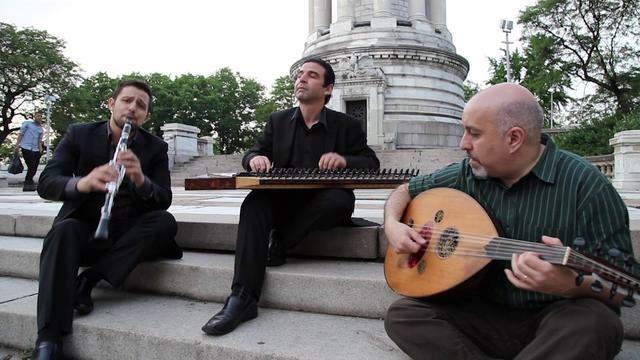 The trio includes Ismail Lumanovski, a virtuoso clarinetist and member of the New York Gypsy All-Stars; Tamer Pinarbasi, a master kanun (zither) player who is also a member of the New York Gypsy All-Stars; and Ara Dinkjian, one of the world’s finest oud (fretless lute) players, who is best known as the founder of the highly influential and groundbreaking instrumental group Night Ark. The Secret Trio has performed in eight countries. In the U.S., major venues have included Lincoln Center, the Metropolitan Museum of Art, and the Smithsonian in Washington, DC. Earlier this winter, the trio played Miami’s GroundUP Festival. The group has made two studio recordings – Soundscapes for the Traditional Crossroads label and Three of Us for Kalan Music. All performances for the UBS Atrium Series begin at 12:30 p.m. The concert is free and open to the public and the venue is wheelchair accessible. Parking is available in the adjacent outdoor lot and public transportation options include NJ Transit Bus 158 as well as the Hudson Bergen Light Rail to Lincoln Harbor. For directions and more info, please check the HRPAC website – www.hrpac.org – or call the concert hotline at 201-716-4540.